Ronda Stubbs has earned the title, Chamber Ambassador of the Quarter, yet again. She was born to serve and does an amazing job at it, always wearing a pleasant smile and making all feel comfortable and welcome. She continually offers to help in any capacity needed, asking for nothing in return. Ronda has volunteered many hours towards the work of the Chamber and is not only a huge promoter of the Chatham Chamber but of her fellow ambassadors as well. Ronda’s son, Ethan, is her pride and joy. Her home away from home is the beach. She cherishes her time with family and friends and enjoys crafting and reading. 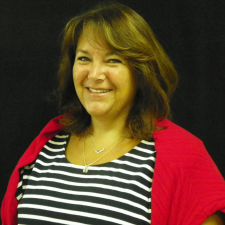 Ronda is the Marketing Director for Silver Thread Communities in Pittsboro, i.e. Cambridge Hills Assisted Living, The Nook at Cambridge Hills and Twin Rivers Independent Senior Community. She has become a common name in Chatham County through her marketing efforts, integrity and professionalism. Her past includes many years in the hospitality industry. Cindy Dameron has been a Chatham Chamber of Commerce Ambassador since 2011 and has always gone above and beyond to help when needed. Regardless of the assignment, no job seems to be too “big” for Cindy. She willingly takes on assignments, asking for no credit in return. One of her many strong suits is the ability to make connections, not only for herself but for others as well. She is an immense addition to the Chamber Ambassador Team. Her extensive knowledge of Chatham County and continuous involvement in the community make her an even greater asset. Cindy has been a long-time resident of Siler City where her and her husband Ron manage a farm. They have two daughters, Jennifer and Ali. Cindy is a Realtor for Realty World Carolina Properties in Pittsboro. She has been in the real estate business for over 20 years, focusing on residential and commercial real estate. She loves calling Chatham County her home and has established deep roots in the community. She seems to know most everyone in the area. Ronda Stubbs has served as a Chatham Chamber of Commerce Ambassador since April 2014. She continues to excel in her service as an ambassador. Ms. Stubbs has been named the Chamber Ambassador of the Quarter several times and was the recipient of the Chamber Ambassador of the Year award twice. Ronda, as they say, has never met a stranger. She relates and communicates well with everyone, making those she connects with feel at ease and comfortable. Ronda truly cares about the wellbeing and success of others. She is professional, conscientious and true to herself. Ms. Stubbs’ dedication to service as an ambassador has been a tremendous asset to the Chatham Chamber of Commerce. “We are proud to have Ronda as part of our team,” stated Cindy Poindexter, President & CEO of the Chamber. Ronda has one son, Ethan. She is an avid reader and enjoys traveling, time away at the beach, yard work, family history, scrapbooking, cross-stitching, and time spent with family and friends. Ronda is the Marketing Director for Silver Thread Communities in Pittsboro. Cambridge Hills Assisted Living, The Nook at Cambridge Hills and Twin Rivers Independent Senior Community are all Silver Thread Communities. Ronda’s past includes years of experience in the hospitality business. Ronda Stubbs has been part of the Chatham Chamber of Commerce Ambassador team since 2014. She has been named the Chamber Ambassador of the Quarter many times and has also been awarded the Chamber Ambassador of the Year award. Ronda Stubbs is a people person. She relates to everyone in one way or the other. She has been an amazing asset to the Chamber and the Ambassador team. Ronda is always willing to help when needed and does a phenomenal job on every assignment. Her amazing character traits make her the perfect fit for an Ambassador. Ronda lives in Bynum, North Carolina and has one adult son, Ethan. She loves the beach and traveling. She enjoys reading, family history, scrapbooking, cross-stitch and time with her family and friends. Karen O’Dwyer has been part of the Chamber Ambassador Team since February of 2017. In this short period of time, she had made such a difference. She has shown concern toward Chamber members and demonstrated her willingness to help in many ways. Karen has proudly and professionally represented the Chamber. She is personable and relates well to everyone which goes a long way in helping new Chamber Members feel comfortable as they first begin attending events. Karen has lived in Chatham County for the past 30 years. She works as a Realtor through Coldwell Banker | Howard Perry & Walston in Pittsboro. Karen went into the Real Estate business because of her passion for helping people. She wanted the opportunity to help with one of life’s most rewarding experiences, selling or buying a new home. Karen enjoys time with family and friends, traveling, working on landscape projects, home design and renovations, and training her dogs. Michael Whitman joined the Chatham Chamber of Commerce Ambassador Team in August of 2015 and has been a valued asset since. Michael is full of energy, enjoys networking, is great at forming partnerships and is passionate about connecting and helping others. He was instrumental, as part of steering committee, in getting the Chamber’s first Young Professional Group on the ground. Ronda Stubbs has been the Chamber Ambassador of the quarter for the third time now. She has done an outstanding job as an Ambassador since 2014 and is an amazing person overall. She has never…ever…met a stranger. Ronda has a very welcoming nature and makes everyone feel comfortable. She is highly respected in the community and considered a tremendous asset by her employer. The Chatham Chamber of Commerce is honored to have Ronda serve as a Chamber Ambassador and a goodwill arm of the Chamber. Ronda loves being a mother. She has one son, Ethan. She enjoys reading, travel, yard work, family history, scrapbooking, cross-stitching, and time with family and friends. The beach is her home away from home. Ronda is the Marketing Director for Cambridge Hills Assisted Living, A Silver Thread Senior Living Community in Pittsboro. Her past includes years of experience in the hospitality business. The first time Michael called the Chamber office, he expressed his desire to be a Chamber Ambassador and to make a difference. He has been an active member of the Chatham Chamber of Commerce Ambassador team since August of 2015. Michael shows up smiling, ready to assist Chamber member businesses and the community. He stands out when it comes to networking, forming connections among others all along his way. He serves the Chamber and its members well. Michael is the co-founder of Millennium Planning Group. He came to Chatham County from Wake County, charged and ready to get involved. Michael married his beautiful wife Nicole, a professional photographer, in November of 2015. He and Nicole live in Pittsboro with their energetic Havanese, Cabo. Sharon Dickens, Financial Advisor for Edward Jones, has been a great team member since she joined the Chatham Chamber of Commerce Ambassador team in May of 2014. She is known by her pleasant smile and professional nature. She comes across very personable and relates well with everyone. Sharon is natured to serve and it shows in all she does. The qualities she has to offer are endless. Erica Sanders has been a Chatham Chamber of Commerce Ambassador since 2013 and has held the role of Ambassador Chair since December of 2014. From the first day that Erica signed up to be an ambassador, she hit the floor ready to serve. She has been such an asset to the Chamber Ambassador team and continues to grow as an ambassador and a professional every day. Erica supports and promotes the Chamber and its members. There does not seem to be an end to her compassion and desire to assist and help others. As we have said before, Erica is like a bright light that always seems to beam. Erica loves Chatham County, and in fact, grew up in Pittsboro where she met and later married her high school sweetheart, Mark Sanders. Mark is the co-owner of Sanders Automotive on 15-501 in Pittsboro. Working out and spending precious time with family is something that Erica enjoys doing. She is also the extremely proud mother of her beautiful five-year-old daughter, Kinley. Erica is the Branch Manager for the Pittsboro location of Carolina Home Mortgage, where she is well respected by her clients. Erica Sanders joined the Chatham Chamber of Commerce Ambassador Team in 2013 and assumed the role of Ambassador Chair in December of 2014. Erica has continued to grow as an ambassador. She is always ready to lend a hand and truly cares about others and what she can do to help. She is like a bright light that always seems to beam. Erica is personable and has a welcoming nature. The Chatham Chamber of Commerce is fortunate and proud to have Erica Sanders on their Ambassador Team! Erica grew up in Pittsboro where she met and later married her high school sweetheart, Mark Sanders. Mark is the co-owner of Sanders Automotive on 15-501 in Pittsboro. Erica enjoys working out and time with family but being a mother to her beautiful daughter, Kinley, is what she enjoys most of all. Erica is employed as the Branch Manager for the Pittsboro location of Carolina Home Mortgage, where she is very well respected by her clients. Honesty and integrity is a part of her character, personally and professionally. Ronda Stubbs has served as a Chatham Chamber of Commerce Ambassador since April 2014. Most people know Ronda by her sweet and caring disposition and her willingness to always lend a hand. She is an inspiration to many people. Her character, professionalism, compassion, and willingness to serve are just a few of the qualities that make Ronda a great ambassador. The Chatham Chamber of Commerce is appreciative of Ronda’s service as an ambassador and feels fortunate to have her as part of the team. It is with great pleasure that we name Ronda as Ambassador of the Quarter, Quarter 1, 2015. Ronda is the proud mother of one son, Ethan. She enjoys traveling, the beach, yard work, family history, scrapbooking, cross-stitching, and time spent with family and friends. She is also an avid reader.